Yooralla can support the NDIS goals of the person you care for with our wide range of tailored, flexible and quality services. We are a disability specialist and we know the NDIS – we have been supporting participants from the beginning of the NDIS. We support people with disability of all ages and needs, and their carers, and have provided supports to people with disability for 100 years (since 1918). Yooralla provides assistance with daily living for adults with disability. We provide one-on-one support, seven days a week, assisting people to live the life they choose. This can cover getting ready for their day, getting out and about in the community, enjoying social activities, getting to work or an appointment. Yooralla provides tailored short-term accommodation (respite) experiences and the chance for people with disability to experience living away from home, while also proving their carers to take a break from the daily routine and the chance to concentrate on other aspects of their life. We also provide in-home respite in a person’s home or their community. The NDIS considers sustainability of support for people with disability, over their lifetime. In these situations the NDIS may fund Support Coordination so a person receives sustainable support over their life, and can manage those supports. Support Coordination aims to build a person’s capacity to undertake tasks associated with the management of their own NDIS supports. If the person you care for is currently living with you and you have concerns about where they will live once you are no longer able to look after them, the NDIS may fund long-term accommodation for them. Or if you cannot care for them for a short time while you are in hospital for example, short-term accommodation (respite) can also be funded in a NDIS plan. Yooralla’s Community Hubs and Supports provide day services to young people and adults with disability to support a range of lifestyle skills and to promote choice and independence. Support is offered on a long-term basis and is planned to complement their existing informal supports – such as yourself, family and friends – and to maximise their community participation opportunities. Our flexible and qualified Therapy team of physiotherapists, occupational therapists, speech pathologists and psychologists can work with people to support them to improve their communication or increase mobility and engagement in everyday activities. Yooralla provides many supported independent living accommodation options for adults with disability, from group style houses to individual accommodation in self-contained flats. With a strong commitment to customer wellbeing and safeguards, we can support the person you care for with daily personal activities and participation in community life. We also provide tailored short-term accommodation (respite) experiences and the chance for people with disability to experience living away from home, while also proving their carers to take a break from the daily routine and the chance to concentrate on other aspects of their life. We also provide in-home respite in a person’s home or their community. Yooralla has developed a free guide to help people with disability and their carers to prepare for their NDIS planning meeting, and it includes an activity planner so you can think about what supports the person has now, their goals and what else they need. We are also holding a series of free NDIS pre-planning sessions across Melbourne. 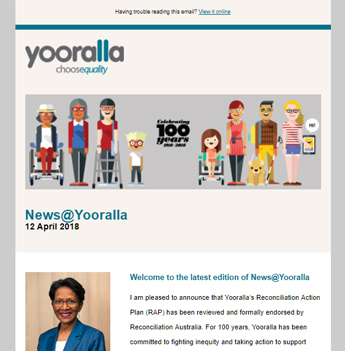 Yooralla has developed a free guide to implementing your NDIS plan. The guide is designed to help people with disability and their carers understand what they need to do after they receive their NDIS plan so they can start using their NDIS supports. You can also book in for a free one-on-one meeting with Yooralla once the person you care for receives their NDIS plan, to make the most of it. We also provide a Support Coordination service to link people with disability with the right providers for their needs, and to support them to understand and implement their NDIS plan. Yooralla supports people with disability to build everyday Life Skills. By focusing on a person’s own specific goals, we can support them to master the skills they need to achieve greater independence, confidence and control. Our training focuses on practical skills that they can use immediately and in the future, from handling money to travel training, meal preparation, personal presentation, independent living skills or literacy and numeracy. Life skills programs are available through Yooralla’s Community Hubs. We can also help people if they’d like to learn new Job Skills to get them ready to get a job now or in the future. Yooralla supports people with disability to pursue their employment goals by providing Job Skills training and building employment pathways into supported and open employment. If you have employment related goals, Yooralla can support you to develop a plan that builds your capacity to gain meaningful work and earn a wage. Yooralla specialises in providing Recreation services to people of all ages and disabilities. Activities can be fun, adventurous or relaxing; they can be group activities or they can support individual goals and pursuits; they may be day activities, a weekend camp, a week away or even longer. Yooralla’s Community Hubs and Supports provide day services to young people and adults with disability to support a range of lifestyle skills and to promote choice and independence. Support is offered on a long-term basis and is planned to complement their existing informal supports – such as family and friends – and to maximise their community participation opportunities. Yooralla’s Communication and Assistive Technology team provides services that can enhance lifestyle, independence and communication ability by providing information about, and access to, assistive technologies and equipment. We support people with disability, as well as the aged, their families and carers. Yooralla is a disability specialist. We can support the NDIS goals of the person you care for, with tailored, flexible and quality services. We are here to support people with disability with whatever goals they want to achieve. We support people with disability of all ages and needs. We know the NDIS - we have been supporting participants from the beginning of the NDIS. We have a wide range of services to support people with disability of all ages and needs. We seek to provide the highest standards in quality, customer wellbeing and safeguards. How can we use Yooralla to provide supports? Yooralla has a dedicated team of experienced specialists who work with people with disability, and can assist the person you care for with implementing their NDIS plan. When the person you care for contacts Yooralla, we will discuss what’s in their plan and how we can help.